I’m gonna go ahead and tell you that this quite possibly may be the only broccoli salad recipe your face will ever need. And when I say quite possibly, I mean definitely. Because it’s…perfect. Did I just say that? I just said that. I don’t use that word lightly! Whether you do or don’t like mayo or mustard or marshmallows or butterflies, I’m fairly certain this will be a winner in your book. Broccoli salad and I go way back. I have vivid memories of my mom bringing it home from Heinen’s when I was in high school. I’d eat it right out of the container no matter how desperately she wanted me to put it in a bowl. What a difficult child I was. It had oodles of mayonnaise and bacon and the like, and obviously, it tasted good. I never considered making it at home until I bought grapes and broccoli at the same time a few days ago and it dawned on me. JK. Cashews. And broccoli salad! Like the one I used to eat! Nostalgia at its finest. I just KNEW I could achieve that same creamy decadence with cashews, and I was right. The dressing could not be simpler. Just blend up raw cashews with a splash of pure maple syrup, apple cider vinegar, garlic, salt and pepper in the Nutribullet and you may just not know what hit you. The base of this salad is raw broccoli. No groundbreaking news there. So let’s talk mix ins! We’ve got almonds, red onion, dried cranberries, and grapes. Crunchy, crisp, tangy, sweet, chewy—gang’s all here. As far as almonds go, roasted and salted for the biggest flavor bang for your buck. I like the grapes for that little pop of sweetness, but if you’re a traditionalist, go raisins all the way. Or dried cranberries. Whatever bite of sweetness that floats your boat. The best part about this recipe is that you don’t have to cook anything. All you need is a trusty cutting board! So I originally published this recipe in 2016 and seeing as I have oodles of delicious old recipes that have rather scary photos to go along with them, I figured I should spend time updating some of them. Since so many of you clearly know and love this one, it made the cut. This broccoli salad is one of those dishes that non-vegan folk would never in a gabillion years know was dairy-free and actually packed with wholesome goodness. We can keep that secret between us, mmmk? It also makes a terrific potluck dish. Broccoli is in peak season from October through April, meaning it’s high time to whip up a batch and share with the people you love the mostest. THIS IS NOT AN APRIL FOOL’S JOKE. If you make this vegan broccoli salad recipe and love it, let me know by leaving a 5-star rating and/or comment! I LOVE hearing your feedback. This recipe was originally posted in March 2016 and updated in April 2019.This recipe was originally posted in March 2016 and updated in April 2019. This recipe was originally posted in March 2016 and updated in April 2019. Recipe by Alexis Joseph of Hummusapien™. Photos by Eat Love Eats. Recipe and photos are copyright of Hummusapien.com. I don’t like traditional broccoli salad because I hate mayo but I can totes get on board with this mayo-less version! YUM! The cashew sauce is perfect! And the sweet grapes! Always essential in these kinda of salads! The sauce would have been perfect, but I used balsamic vinegar and it made the dressing dark, but it still tasted great. I LOVE that you have red onion in the recipe twice! But then I am an onion o holic! I usually double the amount of onion in any give recipe anyways! i am not a big fan of broccoli salad but looking at the combo of cashew cream + grape with broccoli, i may change my mind! I’m loving the idea of using cashew cream instead of mayo – so freaking brilliant! This is 200% the only broccoli salad my face will ever need! I love this healthy alternative! Read recipe at work, had all the ingredients! Delicious! This is a fabulous recipe. Perfect for summer. Love it. I thought it was perfect for Sunday dinner. To get the bacon flavor I miss in dishes like this I added nurtition yeast and a splash of liquid hickory smoke. Is it weird to say that I love broccoli salad? It’s not the most hip food, but it so good! I am totally on board for trying a plant-based version (though I am not anti-mayo). Thanks for sharing! I have never had a broccoli salad before! It is not something us British folk have. That said, this looks TASTY. Just made it and it is chilling in fridge to have tomorrow … husband , Mam and I had a small sample to taste and it is so delicious … I imagine it will be even tastier tomorrow ! This salad is so good!!! I decreased the red onion to 1/2 cup so that it wouldn’t be too powerful on the 2nd or 3rd day. Definitely better served chilled. This is the perfect way to squeeze more broccoli into my diet. I need to find new ways to use cashew cream cuz it’s so easy to make in the Nutribullet. Thank you for the recipe! You’re welcome–thrilled you enjoyed it! Holy florets Batman! Delicious! Amazing! Wow! I am primarily a raw vegan, so I used mostly raw ingredients. I also made my own “roasted almonds” by taking raw almonds, chopping them, mixing in a little sesame oil then adding salt and a little smoked paprika to lend the roasted, smokey flavor. I keep picking and picking and picking! Nothing is going to be left for dinner at this rate! Thank you very much! Thank you for this recipe! My husband who is a carnivore even liked it!! I’m trying to slowly introduce him to a more healthful diet and this is a great addition. Made this for my family tonight, and my carnivorous father-in-law, my eight-year old son, and my wife all loved it. Great recipe. I rarely prepare a recipe and don’t have modifications to offer, but I don’t have any. Loved it just like this (we rocked the grapes). Made this salad on an average Saturday afternoon, What a GREAT raw salad, I didn’t have grapes so I added pineapple. Worked out great. Oooo I bet the pineapple was such a cool flavor. So happy you enjoyed! I normally don’t post my opinion on recipes because my results are usually less stellar than other posters. BUT this one waaaay exceeded my expectations of a salad I really like from our local grocer’s salad bar. I found myself licking the spatula digging all the dressing out of the blender. I made it for my lunch tomorrow but it may not last that long. Awesome job, Alexis! Yayyy it’s the best!! Thanks so much, Lynn! Sign me up for your newsletter please! Love what I have read of your recipes…I want more. I also want more of your tongue and cheekiness!!! Yes please sign up! Love hearing feedback :) happy Sunday! Alexis – Unfortunately I have to deal with nut allergies and was wondering if there was something else that I could use without ruining the salad. Thankyou. Maybe this reply is way too late, but the old school Broccoli Salad was made with mayonaise, so if you can use that, just eliminate the nut ingredients. You can replace the almonds with sunflower seeds if that is acceptable. I’ve always loved that salad, before I discovered this vegan one. Try it! Hi there,I log on to your blog named “YouTube” like every week.Your writing style is awesome, keep it up! And you can look our website about proxy server list. Thanks so much for your thoughtful comment, Tara! I’m the same way, always adjusting recipes. I’m thrilled you enjoyed this one as is. Hooray for hot sauce always!! Would this be nice warm with pasta? I made this yesterday and it was amazing! I used dates instead of maple syrup, golden raisins, and I omitted garlic and onions. Super delish! And super easy. Yay! Love your substitutions. Glad it worked out well! This was FANTASTIC! I brought it to a potluck yesterday and it was the first salad that was gone. I would make this again and again and again!! Not too sweet, perfect amount of sauce. Yum!!! Just made it! It really is a great recipe and will definitely be one I make often! After I tasted it per your recipe, I did add about half a squeezed lemon and also the red pepper flakes as someone else had mentioned. The lemon juice really perked it up! Thanks so much for sharing.? Love this additions! Sounds totally delish. Glad you enjoyed! My family all the time say that I am killing my time here at net, but I knw I am getting know-how daily bby reading thes nice posts. Any replacement suggestions for maple syrup? You could try honey or agave! I can’t guarantee the results since I haven’t tried it myself, but any sticky sweetener should do the trick. Best of luck! Made this to share with my omnivore extended family last Thanksgiving and it was a hit! Made it again for Easter to share with my husband’s omnivore family. It is soooo delicious. I had to add a little less than a tablespoon of water to thin the sauce, but that’s the only change I made. :) Thank you for this wonderful recipe that both vegans and omnivores love! This is amazing!!!! I was worried there wasn’t enough dressing but once I tasted it I said out loud, “How can this be so good?” Thanks for a delicious recipe I will make time and time again! Awwww I’m so so glad!! 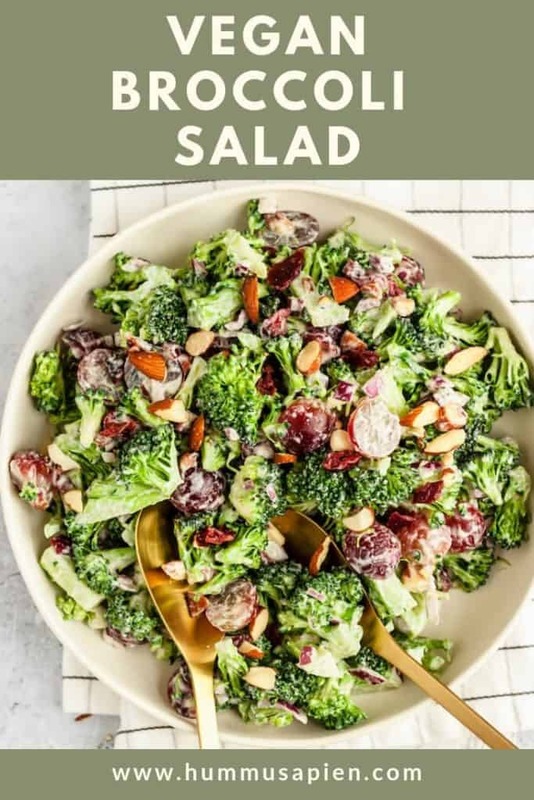 Best broccoli salad! Glad I don’t have to avoid nuts. It is the dish I’m taking to my next vegan potluck. Outstanding! Yum!!! Might make this for the 4th! Is it good to make the night before and keep in fridge? Wasnt sure how the sauce would turn out, but it was fabulous. I did add a lil ginger to it to give it a some zing. All and all, loved this! I am always looking for new and delicious vegan recipes and this one is spot on. Thanks! Very nice, but the dressing seemed sparse. Next time I will double the amount of dressing. My husband loved this salad so much he asked if we could have it again this week! I didn’t add the grapes and substituted sunflower seeds instead of the almonds. It was slightly sweet and very delicious! Boy oh boy….is this ever delicious!!!!! Thanks for the recipe!!!! This salad is the BOMB!!!! Very, very good!!!! My omnivore husband loved it!!! Thank you very much!!!! I’m trying to give this recipe 5 stars but it isn’t working. So I’m not giving it any stars. This was so easy and delicious! My boyfriend and I finished it in one sitting. Thank you so much for the recipe! I’ll definitely be making it again. I took this to a potluck and people raved about it and begged for the recipe! Awww I’m so glad. Thank you! This was lovely and light. I had no Cranberries so had to use dark Cherries and that was fine. Absolutely perfectly named, the Best Brocolli Salad. The best salad I think I’ve ever had. Beautifully balanced and healthy too! 10/10 ? Wahoo!! Thanks so much for the feedback, Shane! Love when it lives up to the name! I was asked to bring a broccoli salad to a family gathering, but I didn’t have a recipe! Luckily, I found yours. It became an instant family favorite. Today, I added cooked farro to the mix, and boy, it was good. Thanks for sharing your recipe. It’s a keeper. Ohhh love the idea of adding farro! Thanks for letting me know, Colleen. SOOOOO GOOD! Reminds me of my favorite broccoli salad that my grandma has always made during the summer! What a compliment! Thanks for the feedback and rating, Ky.
Alexis, such a great looking recipe. I love it when salads include grapes and cashews or almonds. Those add such a great bit of flavor and I really like the texture they add. Can’t wait to try it! Yay! I hope you love it, Amy. I would have to double this recipe so my wife could have some too. ;-) I always loved the traditional broccoli recipe so I know I will love this! I’ll make it this weekend for sure with the mayo substitute.! Fab! Let me know how it turns out. I loved this!! I made it for a girls weekend and everyone raved. Thanks for such quality work and for all the amazing recipes shared. Awwww yay I’m so glad thanks! Do you steam the broccoli first a little bit or you use them raw ?